For many, the world of cryptocurrency still feels distant; a cold and unknown place awash with jargon, and run by elite tech-heads. What most don’t realize is that the entire point of cryptocurrency is, in fact, to provide more choices and convenience to the masses. Anyone following crypto news over the past couple of years will have noticed a growing trend in articles telling us more and more how our new digital tokens can be used to purchase an increasing number of everyday things. Today it may start with Ed Sheeran tickets, but after that what comes next? Already cryptocurrencies can be used for purchasing Windows and Xbox content (2014), Starbucks coffee (August 2018), home furnishings on Overstock (2014), gift cards at egifter.com, luxury goods like at The White Company, and even to make charitable donations. Not only is the list growing, but the revolution is gaining mainstream attention. Back in March 2018, CNBC published an article detailing the increasing number of ways to use Bitcoin. In the same year, The Guardian newspaper in the UK also published a detailed feature on cryptocurrency. This is no longer a “fringe” industry. It has thrust itself into the mainstream, increasingly proving sceptics wrong and placing itself firmly outside of the “passing fad” category. As cryptocurrencies like MITH continue to gain momentum, and usage becomes more commonplace, another revelation is emerging — the miracle and marvel of blockchain-based technology. It is now becoming clear that as crypto use enters our everyday lives and becomes increasingly normalized, a greater number of people are seeing the benefits of decentralization. The security and lack of room for manipulation are particularly attractive, and even more that finally the power of currency could potentially be put into the hands of the masses rather than the elites. The sector isn’t without its challenges, however, and we should all remember that one swallow does not a summer make. Using crypto to purchase concert tickets is another small victory in the long road to meaningful and widespread implementation of cryptocurrencies in the everyday lives of the general public. Cryptocurrencies adoption is rising, no question at all. The government of various countries are also the reason behind this and of course, the big companies that too are joining hands. Not far from a day when MITHRIL like option will be adopted by smaller countries in future! BTW, the cost of tickets are gigantic! How anyone can pay that much for a concert? Here there are so many of my friends who have added Cryptocurrencies as payment option and have received great response as well. So the future indeed belongs to the digital currencies. Nice… I think most are happy with knowing how much it will help the Crypto industry. 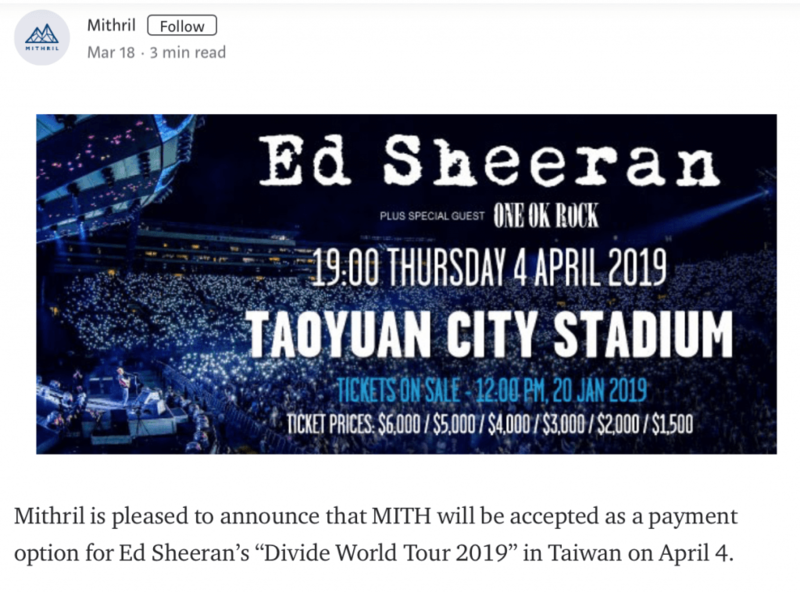 And ED Sheeran is a huge name, so it will bring big crowd. The ticket is probably on the touch expensive side. But nevermind. 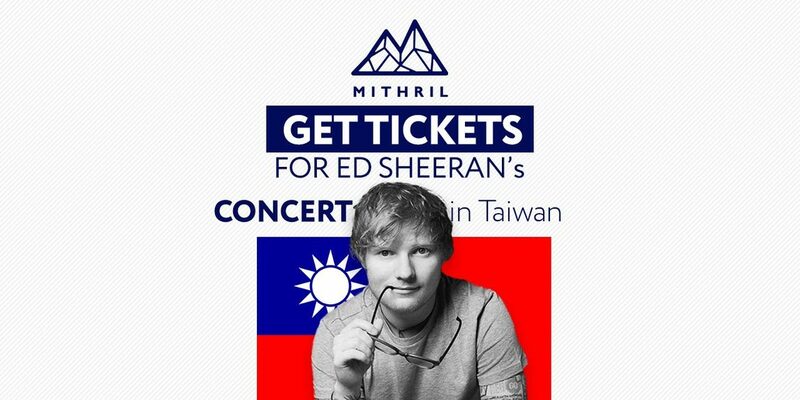 Most here might not know about MITH, but I know it very well as I am connected with them for years now and shouted so many times that it’s one of the finest things, especially from a country like China. And this is the pure example, this is indeed the start of the Crypto adoption to really move far! Great news to hear. I think it will not just help MITH but the whole industry! Not a long way from multi day when MITHRIL like choice will be embraced by nations in future! BTW, the expense of tickets are colossal! How anybody can pay that much for a show? Concurred!!! Cryptos popularity has multiplied in most recent a year or thereabouts. Which appears to be truly astonishing for me given the price diminished to such an extent. Yet, it's no rocket science that it won't stop here by any stretch of the imagination.